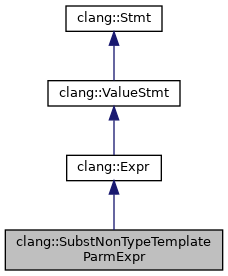 Represents a reference to a non-type template parameter that has been substituted with a template argument. Definition at line 4099 of file ExprCXX.h. Definition at line 4113 of file ExprCXX.h. Definition at line 4140 of file ExprCXX.h. Definition at line 4142 of file ExprCXX.h. Definition at line 4135 of file ExprCXX.h. Definition at line 4128 of file ExprCXX.h. Definition at line 4129 of file ExprCXX.h. Definition at line 4125 of file ExprCXX.h. Definition at line 4133 of file ExprCXX.h. Definition at line 4131 of file ExprCXX.h. Referenced by DecodeOperatorCall(), getExpressionTraitName(), HandleConstructorCall(), and clang::ASTNodeImporter::VisitSubstNonTypeTemplateParmExpr(). Definition at line 4100 of file ExprCXX.h. Definition at line 4101 of file ExprCXX.h.